We had been emailing with former Merkins drummer Jeff Sulima at the tail end of the summer, in another ongoing saga of a band member who hadn't kept a copy of his bands tapes. 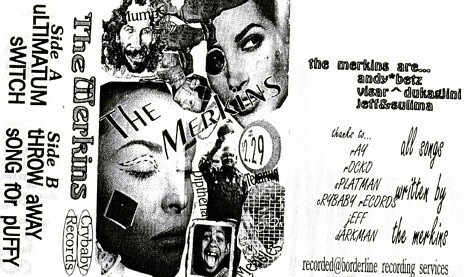 Thankfully, the CJSW archives have ended that dilemma, and we're pleased to present this first tape from the Merkins. We remember the Merkins for two main reasons: their name, which caused much mirth for the permanent adolescents among us here at the CCPS; and the band's musical ability. The drone-y songs on here are a bit muddy, but so's our memory.